Man has always been in awe of nature. Both beauty and power evoked respect. Out of this evolved the Veda's and all branches of knowledge that society based upon natures bounties deemed fit. Fate and the helplessness of man before nature's fury and the pain of human suffering led to introspection and the search for ultimate unalloyed happiness. The search was both internal and external and required intense application. Worship of nature and her images led to hymns and practices that required skill. People drawn to the search devoted themselves and thus began a priestly class. In the beginning there was no specification and those that served as priests also devoted themselves to other livelihood activities to maintain themselves. Slowly evolved Tantra amidst the quest to achieve power and mastery over nature. The powers were phenomenal and the knowledge obtained was vast and varied as a link to another dimension was established. The warriors came to rule and they tapped upon this power through those devoted to it. This established a link in between the warriors and those devoted to worship and Tantra. As cities were established and grew, trade became popular and a set devoted themselves to it. There was also a labour class which provided all their services. Society was composed of these four classes. Gradually began another class. Probably they were those who were punished for various reasons and abolished by society. They became the untouchables and lived upon the favours and whims and fancies of others. During the British rule almost all tribes who valiantly fought them and went against them were declared criminals and outcaste. The Thugees are a case in point. They were not criminals but a section devoted to worshiping the feminine powers. Not all in India ascribed to this classification which was for a long time just an adjustment. Except for the untouchables (even they managed on their own and had their own strengths) all were at peace and united among themselves. They had their own rules and regulations and followed their system of worship even while maintaining a common thread with general practices that were followed by all castes. From time to time appeared reformers who shook things up and removed the clutters that prevented society from progressing. The reformers too were very powerful and after initial opposition they were revered and they often formed religions of their own. The other groups that did not follow the caste system were the Jains, Buddhists and the Sikh. The Britishers wondered how people followed rules in India and maintained their distinction despite the absence of any central religious power like the Church and the Pope in the west. Jostling for power however often sections of the groups clashed but these matters resolved often with payments of fines and atonement or intervention of the local rulers. Slowly this classification became the caste system and refused to let people move on as a group. The Kshatriya and the Vaishya yielded considerable power as it is they who were rich and could influence others. But they were guided by the Dharma and routinely did works of charity. It is they who donated to temples and monasteries and kept society moving. All the monastic orders including Jains and Buddhists were fully dependent on them. All the religious orders kept kings happy and motivated them to follow their religion knowing fully well that royal patronage would help them grow and establish themselves. The Brahmins supplied knowledge and appeased the God's who were feared by all. Slowly the knowledge seekers and the worshipers separated. The King's built huge temples to appease the Gods and establish their rule and the priests became the guardians of those temples. As they became arrogant due to the powers they came to yield true knowledge evaded them and they developed a streak of cruelty. The hermits who belonged to different castes became powerful when they associated with kings. The common Brahmin as apart from the priestly class remained devoted to studying scriptures and depended upon alms received from religious services and often from teaching students in the many Pathashalas that occupied every nook and corner of India. If that did not suffice they indulged in business though it went against the strict rules imposed on them. The term "poor Brahmin" was very common. Only the society's adherence to Dharma kept them going. It was common to find them literally begging at the doors of the powerful to keep the kitchen fire burning. Balaram refused to listen to these wise words and thus laid the base for the ultimate confrontation in Kurukshetra where the mighty Duryodhan fell despite Balaram’s protection. Balaram’s ego too was humbled. The priestly class was mighty but their arrogance and lack of piety ossified society that broke apart. Humility is the armory of the wise. It protects and guides. 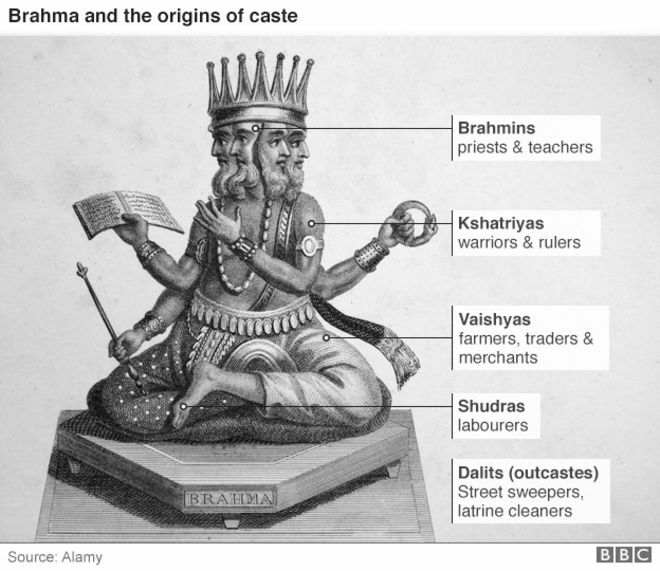 The historic story of "Caste"